a dancer of the sea. and grip my food with glee. 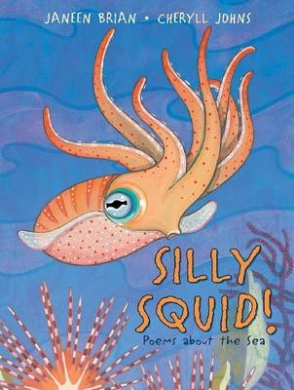 With the ability to colour-change, adapt and hide,the squid of this title poem is anything but silly. And, while there is plenty of fun and joy in this lively collection of poems, there is lots of evidence too of the wonders of the animal world, particularly those that live under and around the water. Silly Squid! is a wonderful exploration of the diversity of the ocean, celebrated in playful rhymes. Each animal is given a double page spread including a poem and a realistic, yet still intimate acrylic illustration. The eyes of the animals look straight at readers, inviting them to get to know their subjects. Each page is finished off with brief facts about the animal in question. These facts, while useful, are on the edges of the page so as to not give them more emphasis than the poetry or art. Readers may choose to read the book from cover to cover, or to read one poem at a time, dipping in and out of the book. From the creators of Silly Galah, Silly Squid! is a wonderful poetry offering for younger readers.